World Open Champion Varuzhan Akobian leads the Continental Championships (July 10-20, Cali, Columbia) together with Julio Granda Zuniga of Peru. Both have 4.5/5 and face off today. The American delegation includes nine players, six of whom are GMs. For complete standings, go to the official website. In rounds four and five, Varuzhan won back to back victories, including an impressive attacking victory over Canadian GM Kevin Spragget. 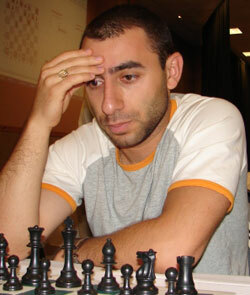 Alexander Ivanov has 4/5, including the following victory over a Mexican IM. Ivanov's winning finesse 41...Rh2! is actually necessary, because otherwise there is no way for Black to progress.